Oauth for OpenWrt routers aims to support authentication via OAuth services (Google, Facebook...) and run on the same box with WifiDog. It is using Luci and provides an alternative to single Auth Server for WifiDog. There is no need to setup a separated machine for authentication. When a new guest uses Wifi from a router to go to the Internet, he/she will be presented a login page where he/she can use his Facebook or Google accounts to log in order to have permission of using our Wifi to access the Internet. When the session of using the Internet is over, a page with a message informing that the user is unauthenticated is displayed, and he/she is withdrawn the Internet access permission. This means he/she must be login again to have the permission. Connect with your router via SSH. Use this command to install Wifidog: opkg install wifidog. Note: if you can not install wifidog, let's first use this command: “opkg update”, and then install it again. 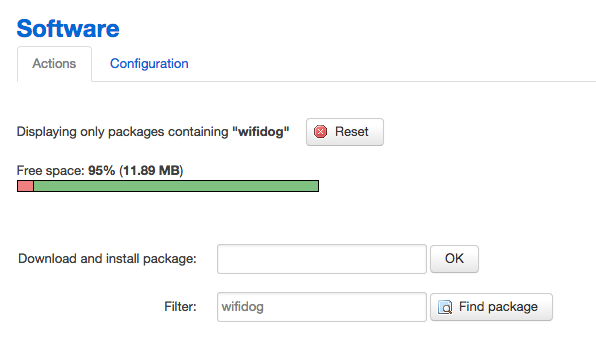 The configuration file of Wifidog is in /etc/wifidog.conf. Use this command to access the file: vi /etc/wifidog.conf. (your router) + AuthServer (your router) + GatewayPort. We provide an ipk package to easily install via opkg. Copy the source folder to openwrt/package (source tree). Run "make package/luci-app-Oauth for OpenWrt/compile V=99" to build. In Terminal, connect to your router via SSH. Oauth for OpenWrt is now ready to work. We have created some nice stuffs for you to make Oauth for OpenWrt work as you like. First of all, you need to access the admin page of router by typing the your router address. There are some options that you can choose to bend the Oauth for OpenWrt with your needs.